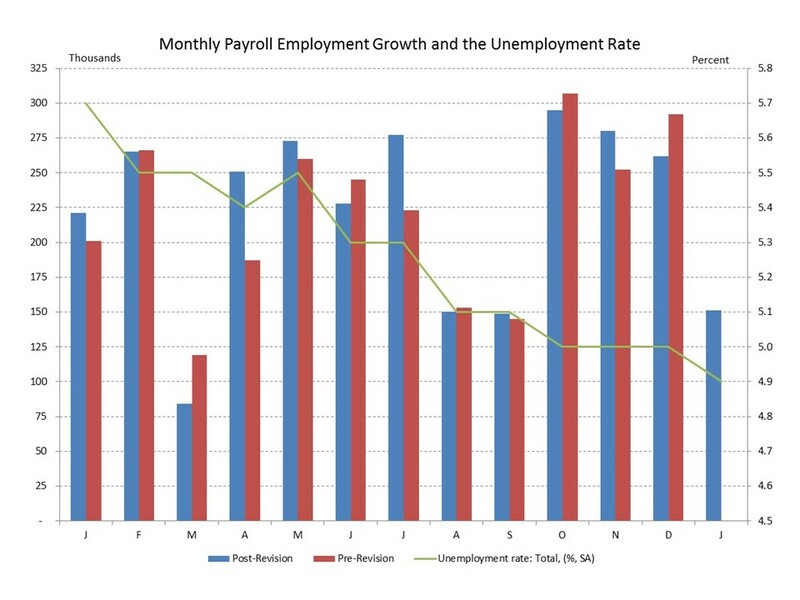 A soft jobs report: a bad month or a cold wind in the face of economic recovery? The Bureau of Labor Statistics (BLS) reported payroll employment expanded by 151 thousand in January (from the survey of payrolls at establishments), an unexpected slowdown from prior months. Results from the household survey were more encouraging, showing the unemployment rate ticking down to 4.9% from 5.0% in December, based on strong gains in persons employed (409 thousand) outpacing decent gains in the labor force (284 thousand). The February release of the January data is the standard vehicle for the BLS to release annual revisions. In the revisions, the establishment survey is benchmarked to more comprehensive counts of payrolls and seasonal adjustment factors are updated. The household survey results reflect updated population estimates. The revisions had only a modest effect, raising average monthly payroll gains in 2015 from 221 thousand to 228 thousand. Despite the decline in the unemployment rate, the unexpected slowdown in payroll growth is disconcerting. Against a background of an initial report of weak GDP growth in the fourth quarter (GDP), growing concerns about China and a slowing global economy, and the Federal Reserve’s trumpeting of labor market improvements despite sluggish economic growth and below target inflation, diminished strength in payroll gains would not be a confidence inspiring development, and would likely put the Fed’s plans for monetary policy normalization on hold indefinitely (FED). One monthly report (with positives as well as some softness) doesn’t doom the recovery, but the next couple of months will be telling.